When we planned a Finnish family adventure about the friendship of a boy and wildcat, we noticed that never before had any Western film featured a lynx, or wildcat, as the main animal. What is more, wildcats are intriguing creatures: on the one hand docile like pets and on the other hand predatory beasts, which demand respect from people. Last but not least, some 700 wildcats live in the wild in Finland. 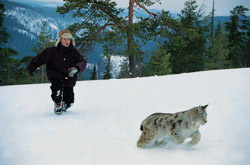 Therefore, a wildcat was a natural choice for an adventure taking place in Finnish Lapland. We notified all the wildlife parks in Finland that we were looking for a wildcat to star in our film. In spring 1996, we received a call from Ranua Wildlife Park, where a recently born wildcat called Väinö had been abandoned by its mother. The park keepers had adopted Väinö and begun to feed it with a nursing bottle. The intendant of the wildlife park, Elina Torvinen, had earlier reared a wildcat named Cat, which still lived at the wildlife park. So, Elina had a lot of previous experience and knowledge about wildcats. We agreed that she would begin to train Väinö for our film. "Cat" also played an important role in the sidelines. To be on the safe side, we needed another wildcat besides Väinö that we might use as a "stunt actor" if need be. According to Elina Torvinen's recommendations, the shooting of the film was scheduled between Väinö's first and second birthday. In this respect Väinö himself decided the production schedule of Tommy and the Wildcat. During the autumn shooting, Väinö remained the only wildcat on the set, but for the winter scenes we began looking for "stand - by" wildcats for Väinö's stunts at an early stage. Fortunately for us, pair of twin wildcats, Isa and Bella, were born at Parken Zoo in Sweden in summer 1997. They shared the same fate as Väinö and were abandoned by their mother. Animal trainer Elisabet Jonsson, who had a wide range of experience in training animals, reared the wildcats. She had, for instance, trained tigers, leopards and other wildcats. Hence, we hired Elisabet to train Isa and Bella for Väinö's winter stunt scenes. We soon learnt during the shooting that we were not dealing with "Lassie" or "Rintintin" in front of the camera. Anyone who has any knowledge of cats knows that you cannot order them around. However you can always play with them! But when the cat decides that the game is over, there is no changing its mind. This also applies to wildcats. Väinö and Konsta got along famously from the start. Konsta soon learnt to trust that Väinö didn't regard him as a potential snack. However, Konsta was reminded that you can never fully trust a wild animal. For the shooting, Väinö had to become accustomed to noise and a lot of people around him, not to mention riding in a car - or on a snow mobile! The director's order for silence during the shooting was diligently obeyed: since the wildcat was usually able to concentrate for only about half an hour at a time, the film crew had to be particularly efficient when the wildcat was in a cooperative mood. The crew was kept to a minimum while shooting the wildcat, because Väinö always had to sniff everyone around him to ascertain that they were friendly. The first thing to keep in mind was that you can't give orders to a wildcat or force it to do what people want, but through games and playing you could achieve what was desired. Most probably the film's wildcats had a great time during the shooting of the film: they got to play all kinds of games, the people around them were calm and the wildcats received lots and lots of attention - which is, after all, what all cats thrive on. One might even write in the end titles of the film that "The wildcats appearing in Tommy and the Wildcat had heaps of fun." In first, the most difficult thing was to make the wildcats look dangerous or aggressive. Under no circumstances did we want to arouse the wildcats' wilder instincts. We made use of Väinö's apparent interest towards the larger fowl in the wildlife park when the wildcat's interest in acting flopped. In particular, "Chicken the Brave" was a source of amazement for Väinö. However, Väinö hunting skills remained dormant: while filming in the studio Väinö and the chicken suddenly disappeared while everyone's attention was elsewhere. Our first thought was that Väinö had devoured "Chicken the Brave". However, after a while, they were found behind a cupboard sitting side by side. They were just taking a break and having a "chat". Now that the film has been completed we can proudly state that the scenes with animals in them are for real, they have not been created with computer animations. TOMMY AND THE WILDCAT is unique, our film. Copyright © 2007–2019 by Ville Suhonen. All rights reserved.